At the sushi bar, a tuna-avocado roll is a tasty and sensible choice. It has less than half the calories of some of the heavier options, such as the shrimp tempura roll, and it contains protein to help you feel full. Just watch out for additives, such as sweet or creamy sauces, which may increase the calorie count considerably. 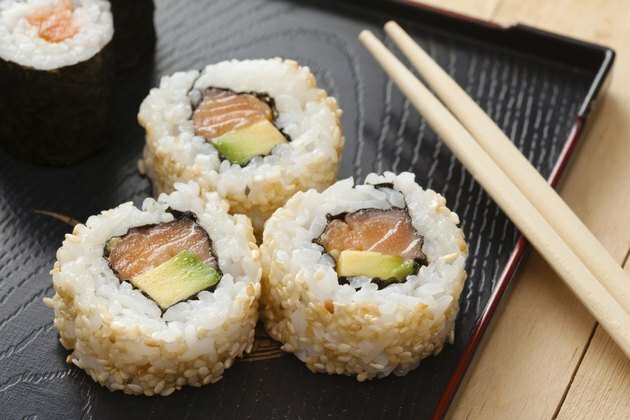 Calorie counts vary, but a tuna-avocado roll from one chain restaurant contains 270 calories. Spicy tuna-avocado rolls may have more, however, because the spicy sauce often contains mayonnaise. At 94 calories per tablespoon, mayonnaise is a calorie-dense food. Soy sauce will also increase the total, though not by much: Each teaspoon contains about 4 calories.